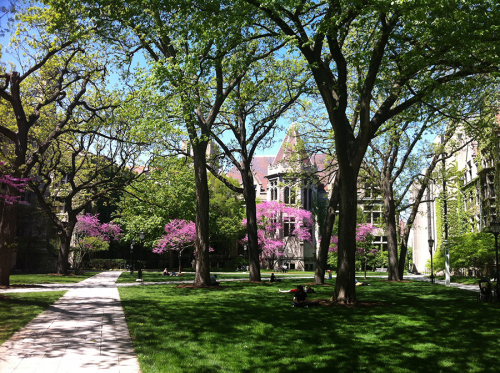 Although located in an urban area, the University of Chicago’s 217-acre park-like campus has more than 3,500 trees representing more than 50 species, many which are native to our region. Managing the trees on campus requires an ever-evolving inventory of the collection. Through collaboration between Planning + Design and Landscape Services, divisions within Facilities Services, the first tree inventory was completed in 2005. In 2011, an updated inventory featuring an interactive website allowing users to review and interact with data was unveiled. For more information, click University of Chicago’s tree inventory. The database system allows searching for trees by age, common name, genus, or tree ID. All trees in the care of UChicago have a blue metal tag listing an ID number attached to the trunk. If you’d like information on a specific tree – simply type the ID number in the ‘View by Tree ID’ filter option box. Ongoing updates to the inventory are required due to the naturally evolving state of this priceless asset. Inventory protocol calls for information collected on individually planted trees including a tree’s genus and species, diameter at breast height (or DBH, which is a proxy for tree age), height, and condition. In addition, the location of each individual tree has been recorded using Global Positioning System (GPS) instrumentation that allows for accurate mapping. Sweetbay Magnolia, Magnolia virginiana. Located on the north side of Botany Pond, on the south side of Zoology. 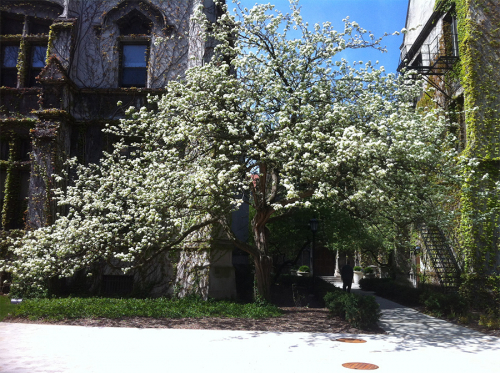 Planted in 2004, this is UChicago’s only specimen of this beautiful evergreen. Weeping European Beech, Fagus sylvatica ‘Pendula’. Soon to be the centerpiece of the new Hall Garden at the Laird Bell Law Quadrangle this beech was planted in September 2013. Its estimated age is 35 years. Once you’ve investigated the broad spectrum of trees growing on campus, we hope you will gain a broader understanding of this important element of the University’s Botanic Garden.